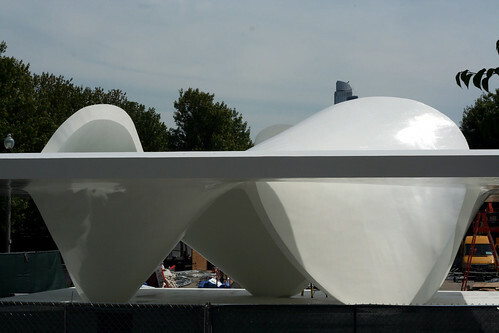 A risk highlighted for Chicago's bid, the planned use of many temporary venues, reflects an IOC desire to have its cake and eat it, too. Based on the 2003 report of a Games study commission, the IOC espouses the idea of not wanting host cities to build expensive, permanent venues that will become underused, costly-to-maintain white elephants. Yet it also is thrilled when a city like Beijing goes overboard to do just that. 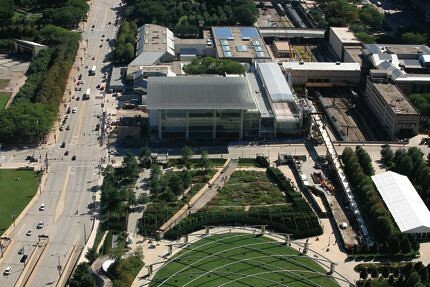 In its detailed evaluation of the Chicago bid's response to the 17 themes assessed, the report praises the city's concept for being ``in line with the IOC Games Study Commission recommendation to `build a new venue only if there is a legacy need...''' In the same sentence, the report says that means a greater burden on the Olympic organizing committee (OCOG) to pay for and deliver that part of the project, as opposed to cities that build permanent structures and do not assign their cost and development to the Games operations (OCOG) budget. In its summary of the Chicago bid, the report says there is increased risk in Chicago due to an ``emphasis on major temporary or scaled-down venues.'' That includes the Olympic Stadium, which would be a temporary, 80,000-seat structure. Chicago bid officials have insisted their venue plan not only is financially responsible but could be a model for future Olympic host cities. 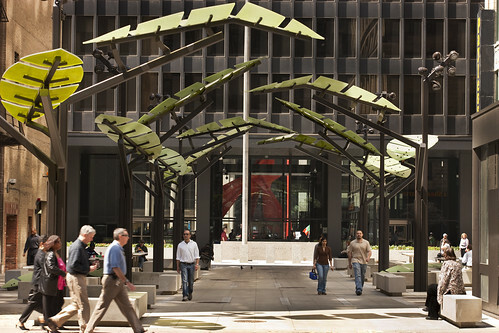 There is a lot to like about Chicago's Quincy Court, an alley turned public space outside the Mies van der Rohe-designed Dirksen Federal Building that opened this summer. The General Services Administration (GSA) initiated the project to help beef up security around the federal campus, and they can certainly be praised for hiring a design firm to reimagine the space, in this case Rios Clementi Hale of Los Angeles, instead of just bolting a bunch of bollards into the ground. And while the design has a certain whimsy, which may appeal to some, we're having a hard time getting over the giant plastic palms. 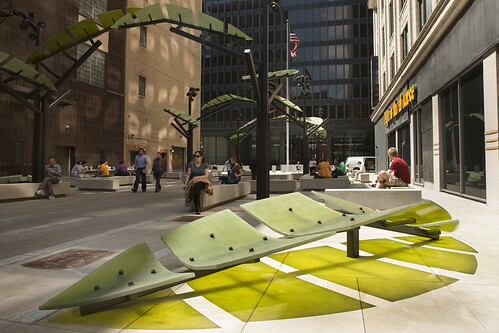 According to the press release the "sculptural grove" mediates between the monumentality of federal campus and the smaller scale of State Street. The seating and tables are nicely detailed and the project's Pop sensibility is sure to change the way people think about this alley way. But in this age of ecological crisis, and in a city that has made sustainability one of its hallmarks and has worked hard to green the Loop, the plastic palms seem like the wrong message for the GSA to send. Real deciduous trees, after all, provide shade in the hot summer and loose their leaves in the fall when sun is welcome. 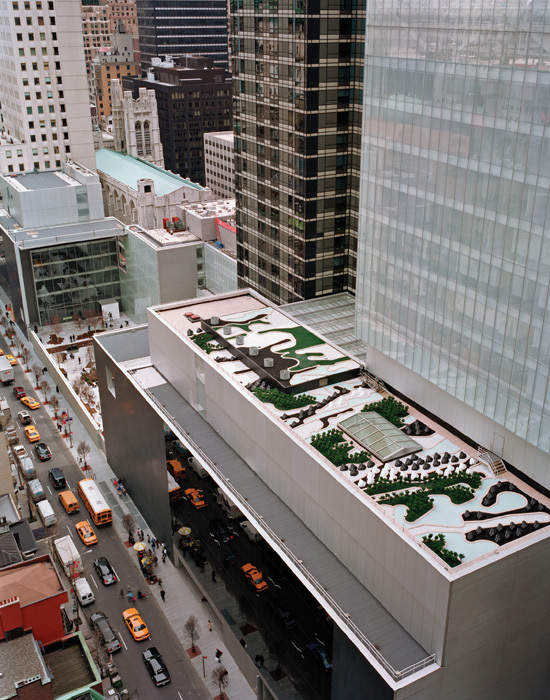 Ken Smith's artificial rooftop garden at MoMA, which boasts fake rocks, plastic plants, and few environmental benefits, seems like a similar missed opportunity, a one liner that provides intriguing views for neighbors but does little to improve the hardscape environment of midtown Manhattan. Are we being too rigid in our thinking? Should we loosen up and go shopping for some silk flowers? 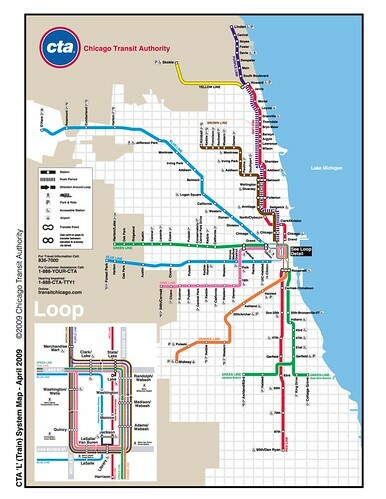 On Wednesday, the Chicago Transit Authority (CTA) approved a plan to extend the Red, Yellow, and Orange L lines. The vote clears the way for the CTA to pursue federal funding for the line extensions. Under the plan, the Red Line would gain 5.3 miles of track, four new stations, and stretch to 130th Street. The Orange Line would extend past Midway Airport with a new station at 7600 South Cicero Avenue. The Yellow Line would would gain 1.6 miles of track and one new station at Old Orchard Road. The CTA will begin Environmental Impact Statements, the next step in the federal funding process. Friend of AN Ryan Lafollette sends this dispatch from the Windy City. Recent graduates of the School of the Art Institute of Chicago’s (SAIC) architecture and design programs are facing a challenging job market. 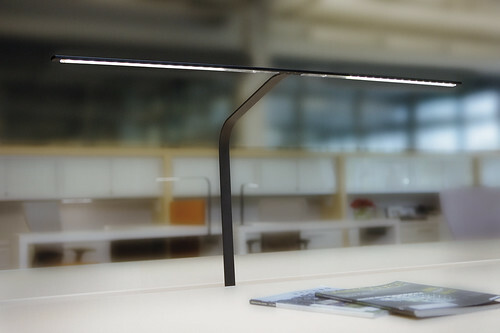 For those employers looking for new talent, as well as for enthusiasts of design who couldn’t make it to the Salone Internazionale del Mobile in Milan, SAIC’s department of Architecture, Interior Architecture, and Designed Objects is currently showing its graduate design exhibition, Making Modern. While the scope of the projects vary greatly, each promotes sustainable design and living practices, and includes student work featured in Milan. 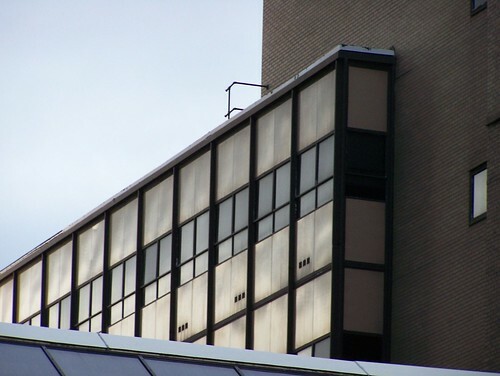 Aiming to reduce costs associated with building air conditioning by up to 20%, Matthew Stewart designed and developed a system of precisely oriented brise-soleil using waste wood from lumber processing and building construction. Slightly more whimsical but with broad implications in the developing world, Taikkun Li created Tibetan prayer wheel generators, fashioned using old bike tires and fan motors, allowing tourists to lessen their impact on an already strained electrical grid. Daniel Sommer attempts to eliminate excuses about cycling to the office. 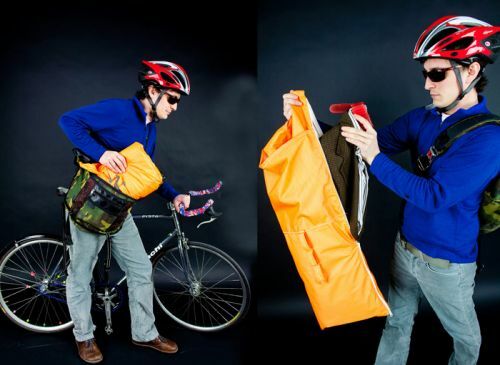 He designed a compact folding hanger and garment bag system that easily slips into your existing messenger bag or carryall. In a competitive market, these innovative, cost-cutting, and energy-efficient designs may give these young practitioners that much needed leg up. Making Modern will be on display in SAIC‘s Sullivan Galleries, located in the Louis Sullivan designed Carson Pirie Scott & Co. Building, 33 South State Street, Seventh Floor, Chicago, through July 25. Part of Ferris Bueller's Day Off (1986) renown as a classic truancy film and Chicago landmark travelogue is the über-modernist glass and steel house with the disaster-inviting garage from which Ferris launches the priceless 1961 Ferrari belonging to friend Cameron's father. The house (and garage), of course, is a metaphor for Cameron's sad and lonely home life. As Ferris, the budding architectural critic, explains to his vaguely suicidal foil, "The place is like a museum. It's very beautiful and very cold, and you're not allowed to touch anything." Attention melancholy home buyers in search of beautiful and cold! This 1953 Miesian knockoff of cinematic fame, located in Chicago's tony Highland Park suburb, is now for sale for $2.3 million. Designed by "Less is More" disciples A. James Speyer (1913-1986) and David Haid (1928-1993), the 5,300-square-foot house is being sold "as is" (two of the most anxiety-producing words in real estate). Selling point: Because the house is sited over a maintenance-free ravine instead of a lawn, the new owner can route those savings right to the perpetually depleted HVAC fund.